Deer are lovely wild animals that live throughout North America. In spite of land clearing and the building of cities, towns and homes, the deer populations have not suffered since the American colonists first arrived on the East Coast. However, this animal can wreak havoc on vegetable gardens, vineyards and orchards because it can jump over a 6-foot fence to get at food that it eats. The white-tailed deer and the mule deer are the two species of deer native to North America. Two subspecies, the Pacific coastal blacktail deer and the Alaskan Sitka deer, are related to the mule deer. The small Coues deer lives in the southwest and is related to the white-tailed deer. The Florida key deer is another small relative of the white-tailed deer. Deer originated in Mongolia over 10 million years ago, and then migrated to the rest of Asia and Europe. They arrived in North America over the Alaskan land bridge that existed in ancient times and assumed their current appearance about 1 million years ago. They thrived in this fertile land until Europeans arrived--estimates place their numbers at 40 million whitetail and 10 million mule deer. But because of the introduction of guns and the thirst of hunters for their hides, both species’ numbers dropped to 500,000 or so. Laws now prohibit unlimited hunting and the Wildlife Management Institute of Washington, D.C., estimates that nearly 14 million whitetail and up to 7 million mule deer reside in the United States. White-tailed deer are most common in the Eastern United States and occur in all 48 mainland states. They don’t mind living near towns and cities and can be a problem to farmers and gardeners whose property they often visit at night in search of food. The mule deer is more common in the Western states, from Alaska to Mexico. It is larger than the white-tailed deer, making it capable of jumping fences as tall as 6 feet in search of food in gardens and orchards. Deer prefer to live in the cover of pine tree forests and plantations, but also live in swamps, woodlots, ridges and plains. With their acute sense of smell, all deer are grazers and they also browse through forests and other areas for food. They like to eat soft vegetation in the summer--including fruit--and switch to brush in winter. As herbivores, deer have been known to eat many plants. In addition to leaves and fruit, deer also like corn and nuts such as acorns and hickory nuts, especially in fall and early winter when they need to build up their body fat. Deer like to eat cultivated plants that have been fertilized. They have been observed eating dead fish, which contradicts their herbivore nature. In the Midwest, deer pose serious threats to fruit orchards. Although they feed in these areas in winter when trees hold no fruit, they damage the trees by eating young twigs and the buds of flowers and new growth. They especially prefer apple trees. 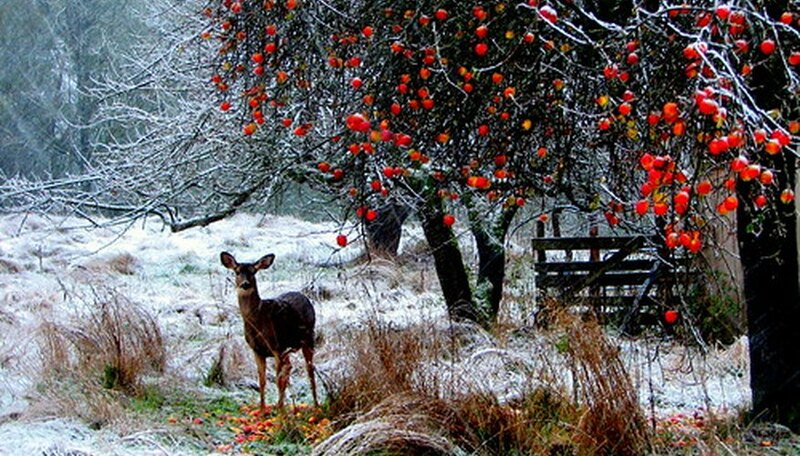 Male deer, or bucks, cause further damage to fruit trees by rubbing their antlers against the trunks of small trees. In spring and summer, deer of both genders eat the trees’ leaves, buds, fruit and immature shoots. Owners of fruit trees have used several methods to keep deer away from their orchards and gardens. Some have built wire cages around their trees, which prevent deer from getting close enough to eat any part of the tree. Repellant products that you spray on your trees are available commercially--they contain ingredients such as old eggs, coyote urine or blood, none of which deer like. Backwoods Home magazine reported that one homeowner was successful in deterring deer by placing wire fencing on the ground around the base of their trees. They claim it kept out deer, bears, dogs and other four-legged animals. Deer cannot jump a fence that is 8 feet tall, so for areas that you can enclose, a tall fence is effective in keeping deer out. Electric fences are also effective. Ultrasonic repellents have been reported to be helpful as well. What Is a Wild Plum Tree?